Choosing which road to take in an area that’s over twice the size of California (901,575km2 to be precise), can be a little overwhelming at the best of times. Throw in niche interests like dinosaurs, endurance events and pioneering history, and the decision of which of the nine drive routes you’re going to take becomes even harder. Cutting through Outback Queensland like a hot knife through butter, the Matilda Way ventures vertical from Cunnamulla in the south to Karumba in the north. Kick off your trip with a visit to the Cunnamulla Fella, before taking off to the star-studded town of Charleville. Check out the Cosmos Centre and Observatory, before stopping to say hi to the bilbies at the Charleville Bilby Centre. Heading north-west, pay visits to Tambo, Blackall, and Barcaldine, before arriving into Longreach for the night. Spend a few days discovering the heart of the outback before hitting the road to Winton. Here you’ll discover a story about a jolly swagman at the Waltzing Matilda Centre and lay your eyes on the world’s largest Australian dinosaur fossil collection at the Australian Age of Dinosaurs. Veering further north, Cloncurry awaits, where the deserted Mary Kathleen Mine haunts some of the richest land in Outback Queensland. Before you arrive in Karumba, be sure to stop by Normanton to snap a photo with Krys the Savannah King, a replica of the largest croc in the world (8.6m), who was caught in the area in 1957. Weaving from Brisbane to Birdsville, watch the city lights fade away as you make tracks west along the Warrego Way. Your first taste of the outback is Roma, aka cattle country. Time your trip for a Tuesday or Thursday to see the largest cattle yards in the southern hemisphere in auction-action. From Roma, take a history lesson at Charleville’s Top Secret WWII United States of America Air Forces (USAAF) tour, before heading further west. Join the dots on the map between Quilpie, and Windorah (home to the International Yabby Races) before visiting a town with a population of zero, Betoota. The iconic outback town of Birdsville marks the end of Warrego Way line, but if you choose to time your travels with the race that stops the outback, or the world’s most remote music festival you’re guaranteed to stay and play a while in this tiny outback town. 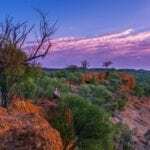 The clue is in the name with this track, the Overlander’s Way passes across the northern pocket of Outback Queensland, taking you from Townsville’s coast to the country, with dinosaurs, cowboys, and remote landscapes on the itinerary. You’ll start to see red dirt from Hughenden, the town which buddies up with Richmond (next on the route) to create two-thirds of the Australian Dinosaur Trail. From there, head west to Julia Creek, where a small town of 400 people waits for the night. That is, unless you’ve chosen to come for the second week in April when 3,000 people join the town for an annual triathlon, the Julia Creek Dirt n Dust Festival. Passing through Cloncurry, continue on the Overlander’s Way to arrive in cowboy country, aka Mount Isa. Home to the largest rodeo in the southern hemisphere, get ready to don your Akubra and start boot scootin’. With a name like the Adventure Way, you know you’re in for a road trip of epic proportions. You’ll know you’ve hit the right tarmac from Brisbane when you reach Cunnamulla, which has the largest population of roo’s and wallabies in Outback Queensland. Stop for a while in Eulo, where you can rejuvenate your body after the long hours of driving by soaking in a tub full of ancient artesian mud, while enjoying a glass of wine, the fresh air, and a view of the outback. Continue on to Thargomindah, which houses the world’s third (and Australia’s only) hydro-electricity system, embracing it after London and Paris. Finish the road trip by crossing the border to South Australia, to the tiny town of Innamincka, with a population of just 12 people, to celebrate your journey. Shakespeare first asked ‘what’s in a name’, but Australia’s Country Way has got your answer, with this road trip taking you up the nation’s east coast – outback style. Starting in Sydney and trailing up through Queensland, this inland route passes through Biloela in the Banana Shire, best known for its national parks and natural encounters. From Biloela, it’s a two-hour journey to Rockhampton, the beef capital of Australia, where this road trip comes to an end. If Australia’s Country Way got you hooked on country over coast, we raise you an extra 248km across the Great Inland Way. Starting from Sydney, your first and only taste of Outback Queensland is cattle country, otherwise known as Roma, where you can catch weekly cattle sales, tour the Big Rig at night and hit the races for the annual Easter in the Country Festival. 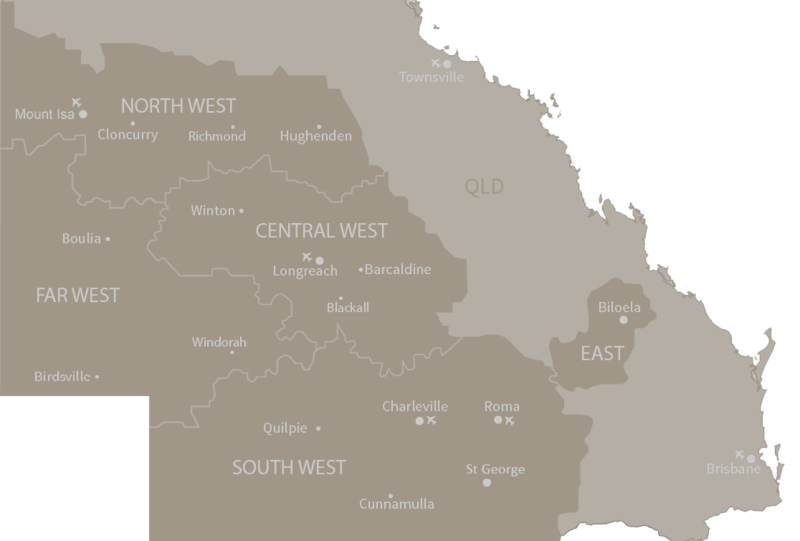 From Roma, continue up the coast of Queensland to the tropical north town of Cooktown, passing through Emerald, Charters Towers, and Port Douglas. Starting at the southern border of Queensland, the Leichhardt Highway goes from bush to beach. You won’t regret a stop in the outback town of Banana, which contrary to what its name suggests wasn’t named for its abundance of the tropical fruit. The town was actually named after a local yellow coloured cow that was given the fruity nickname. You might have to think outside the box when it comes to imagining the forest-like landscape that once filled Outback Queensland when dinosaurs roamed the land. Make tracks towards dinosaur country, with a triangle of towns (Winton, Hughenden, and Richmond) creating the Australian Dinosaur Trail. Explore the historical hub to witness evidence of a dinosaur stampede, the largest Australian fossil collection, and ancient marine creature fossils. For your ultimate guide to spotting dinosaurs in the outback, check out this list. X marks the spot for science lovers on the Natural Sciences Loop, circling the local treasures of the south-west pocket of Outback Queensland. Starting at Charleville, work your way clockwise through Cunnamulla, Eulo, Thargomindah, Eromanga and Quilpie to discover the history, natural beauty, science, and flora and fauna of the region. For a five-day itinerary following the loop, check out this guide. Have you driven along one of these major routes? Where did you stop along the way?